Summer's street bikes came in orange colors, courtesy of Holland. 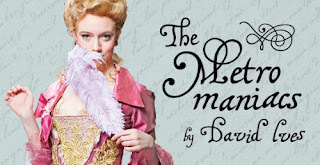 Now February is cheered up à la Dutch with one of the kookiest promos I've seen in the city. Courtesy of The Netherlands Board of Tourism and Conventions, you can ride one of three subway cars on Track 1 of the S shuttle and feel like you’re in Holland. 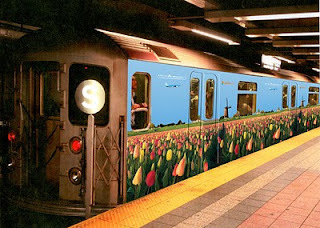 Painted and outfitted inside and out with graphics designed to transport you to tulips and canals, the subway cars zip you from Grand Central or Times Square to Holland for at least a few minutes. You can practically taste the Stroopwafels as you gaze at museum paintings or float along a canal. • February 11-17 contest: Bling yourself out by winning a Gassan 121 diamond. • February 18-24 contest: Welcome spring with a bike ride through the park on a traditional Batavus Dutch bicycle. • February 25-March 3 contest: Upgrade any room in your home with a modern Carbon chair designed by Marcel Wanders and Betjan Pot. One lucky winner will also win the ultimate Holland experience: two round-trip business class tickets on KLM Royal Dutch Airlines, with a four-night stay at the luxurious Sofitel Amsterdam The Grand. P.S. 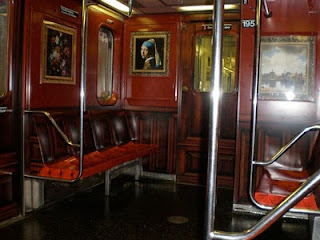 All MTA trains should look this good all the time. I'm commenting on my own post -- I rode the trains again this weekend and they are GORGEOUS. If you can, do try to see them.